Concare, a concrete floor protection contractor, has designed hundreds of flooring solutions for the healthcare industry including hospitals, clinics, animal research facilities and heliports. Help your facility stay clean and microbial free the Concare way. Maintaining a sanitary, safe and productive environment is vital to the well-being of staff, patients and their visitors. Keep boiler room concrete floors protected from extreme temperatures, boiling water, chemicals, anti-microbial and more. Keep bathrooms and showers sanitary and safe with slip resistant and anti-microbial floors and walls. 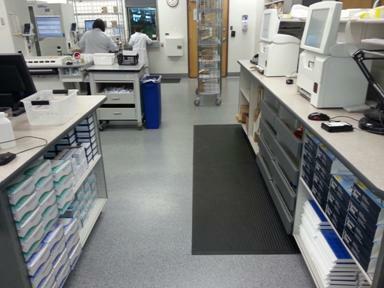 Keep diagnostic, x-ray and radiation rooms protected with anti-static or ESD protected floors and walls. Keep operating rooms and emergency rooms under control with anti-microbial flooring and wall systems. Sanitation controls the growth of bacteria and unwanted bugs on concrete floors and walls. Eliminate cracks, chips, gouges and other hiding places for contaminants with a seamless anti-microbial floor coating. Floors in hospitals, clinics and boiler rooms, floors can be slippery due to smooth surfaces, creating unsafe working conditions for patients, visitors and employees. Water and other liquids can create a slippery surface. Add a slip resistant floor coating to create a safe, stable working surface. Concare provides an array of safety conditions on the floor including slip resistance, safety striping, color coding and 5S markings to help prevent accidents and direct the flow of foot traffic. People who work with chemicals know the EPA has strict rules about preventing substances from leaking into the ground. A floor or wall coating system keeps chemicals from penetrating the surface. You know how difficult is can be to remove spills, grease and other soils from the hospital floor. A sealed floor is easier to clean and maintain reducing labor costs and increasing sanitation. Learn more about our healthcare floor coatings and ask for a flooring evaluation.